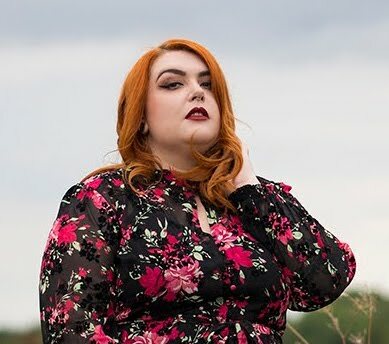 My Plus Size Winter Coat Picks - Sugar, Darling? I know it seems odd to most, but I always look forward to Autumn. Not just because it's my birthday and the leaves turn pretty colours, not just because of Bonfire Night and that festive feeling, but because I can buy a new Winter coat. I was always the same, every Summer holiday I'd get super excited about getting a new pencil case. Silly silly silly I know but I just adore a good coat! Every year I say I'll go for something a little more adventurous, but every year I always go for a long black fitted style because I think they're so classy and go with any outfit. Last year I did break free a little and bought a second, berry red style from the Evans 12/12/12 sale, but I still ended up wearing my black belted number more. 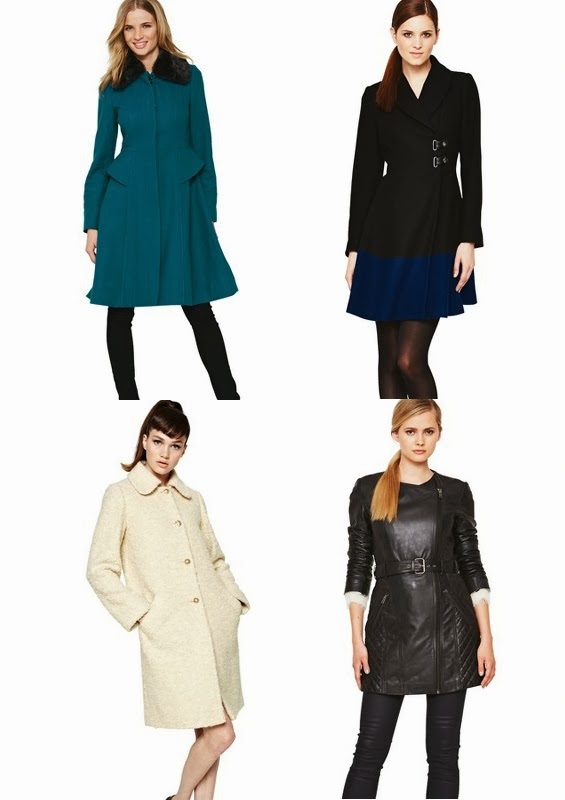 Unsurprisingly these picks do include an awful lot of black coats, but there are lots of styles this year that have caught me eye. I love that the cape coat is back in as they're so elegant when paired with a pencil skirt or some tapered trousers and the longer length biker jacket trend is definitely something I'm in to - adding a punky edge to a silly cutesy dress has always been my thing and this just means you can take that trend into the colder months too if you also add a nice pair of thick tights! Soooooo here are my picks! 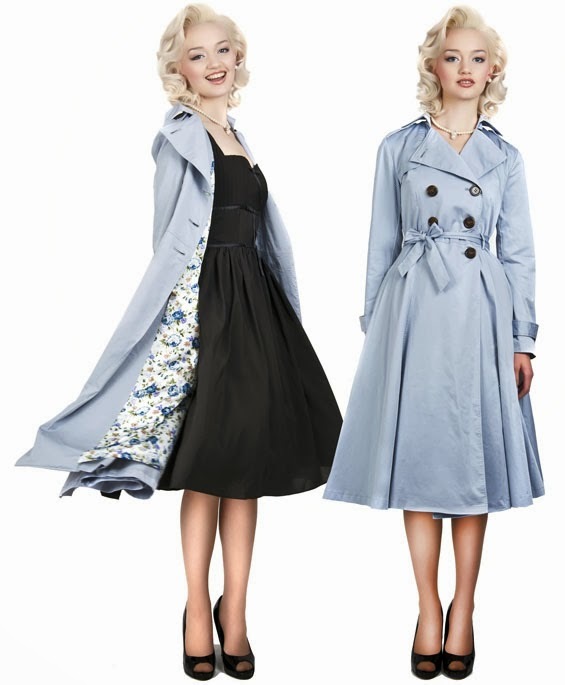 I started with my absolute favourite up top there, the truly stunning Dietrich Swing Trench Coat by Collectif. It goes up to a size 22 and is the absolute perfect shade of blue for a platinum blonde like me! If you aren't of a bleach blonde persuasion you can also get this delightful style in black, beige and a delicious new shade of bright red! Isn't the flowery lining of the blue shade just darling?! 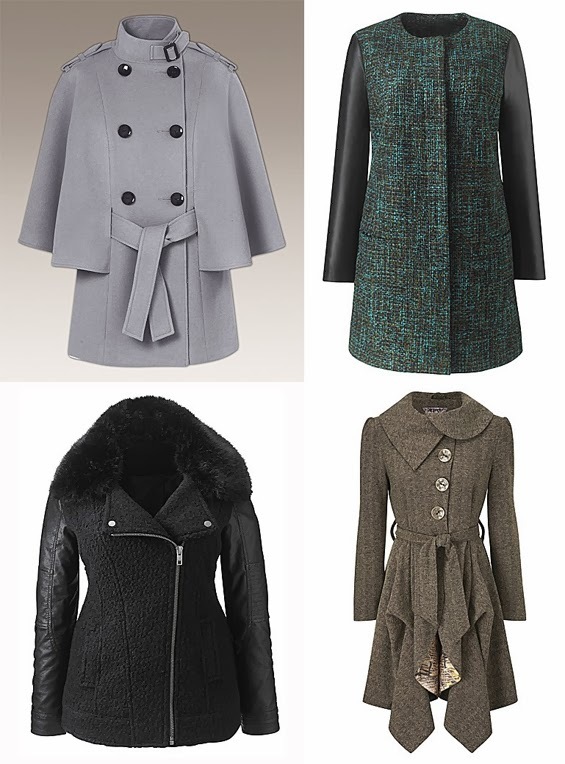 Simply Be have a really lovely varied range of coats and jackets in at the moment. As you can see here is one of my beloved Cape Style Coats if you fancy going for a little Sixties style chic, or if you wanted to be a little more modern but still with an old school twist you could go for the fabulous PU Sleeved Collarless Coat. If you fancy the more edgy look this Fur Trim Boucle Biker Jacket with Leather Look Sleeves would be perfect and so snuggly warm on a chilly evening, and if you fancied standing out in a really unusual cut this Joe Browns Absolute Coat with Draped Hem is fantastic. I hadn't thought anything of it when I first saw it online, but a lady at the vintage fair I worked at on Sunday had it on and it looked fan-tas-tic. 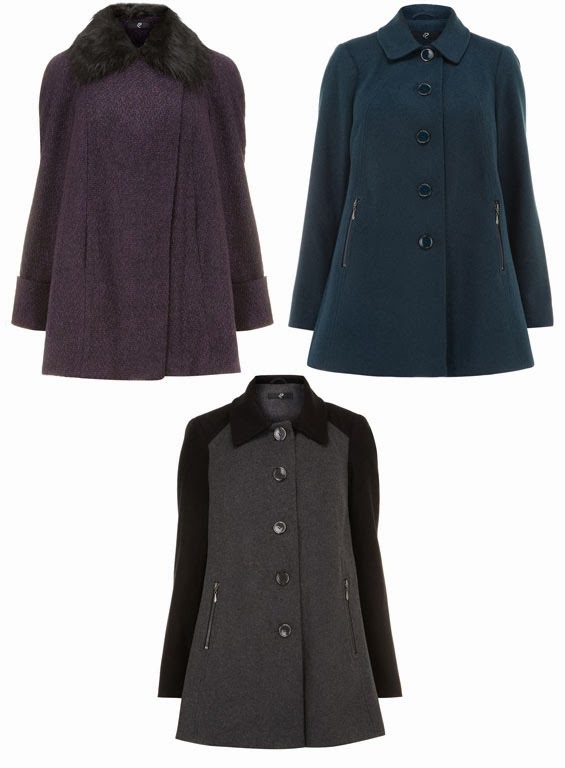 Evans have got some lovely swing style coats in this season which are fabulous if you have a bit of a tummy on you. I always add a belt to these styles to define my waist a little more - as we all know I am a fan of the hourglass shape - but they are super comfy to wear as it's such a relazed style. The fur collar and hidden fastenings on the purple coat give it a more fancy air, whereas the petrol blue and the colour block styles are a little less formal but still smart if you need them to be. Lastly here's a nice selection from Littlewoods / Very. I have actually purchased the first style which is the South Fit and Flare Coat with Faux Fur Collar but in black (I know I know) and it fits beautifully and is a lovely just above the knee length. The fur collar is detachable so I can swap it for some of my vintage furs if I fancy it and it goes up to a size 24. Unfortunately these final three styles only go up to a size 20 but were too nice not to mention. I just can't resist the colour contrast on this Definitions Buckle Waist Fit and Flare Coat and that buckle detail is a great touch. You can get another bit of vintage style glam here with this pretty Glamour Princess Coat, although do be careful what you lean on or you'll be back and forth to the dry cleaners like nobody's business! Lastly we have another longer length biker style with this Definitions Belted Leather Trench Coat. It has just the right amount of quilting (i.e. just as a detail - I loathe completely quilted jackets and gilets) and it looks so much more expensive than it actually is.